It’s time to once again review new and improved shooting jackets for this coming season. Traditionally the CLA Gamefair has been the launch for new styles of game shooting clothing, but with the demise of the show last year we will be having a split launch at 2 new shows; The Game Fair at Ragely Hall and Countryfile Live at Blenheim Palace. So if you’re looking to get in on one of these new styles first, we say get yourself to one of these country shows! I’m starting this year’s review with Tweed, partly because it’s a really quick one to cover as there are essentially no changes from any of the leading brands. Although Tweed is the ultimate go-to in traditional shooting fabrics, there has been a great deal of innovation in tweed over the last few years. These days it is much more common for Tweed to be considerably lighter, more durable, and even machine washable. This year however has seen a pause in the innovation with Barbour being the only big name to launch a new jacket. In reality Barbour’s new Moorhen Tweed Jacket is actually just a rework of last year’s Sporting Tweed jacket, which I must note was an exceptionally good jacket and great value for money when compared to its competitors. 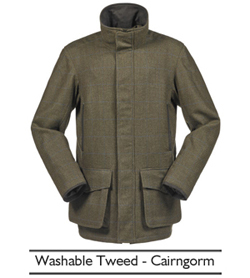 It’s fair to say that the Lightweight Washable Tweed Jacket from Musto comes in a stunning new colour called Cairngorm. Alan Paine who seem to be the up and coming new players in the country shooting market have added striking new colours to their Compton and Rutland ranges; Peat and Dark Moss. The original Highland Jacket was the benchmark to which all other shooting jackets were compared to for over 20 years, as it was the first shooting jacket to ever feature a GORE-TEX® lining. 2 years ago Musto unexpectedly dropped the original Highland from their range without giving a reason as to why. The Highland it is not only back, but has returned in 3 different weights! 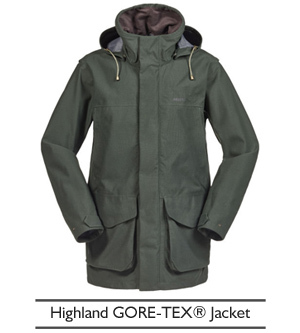 At the very top of the scale is the Highland GORE-TEX® Jacket. This coat is absolutely true to the original Highland ethos; it has been designed for the ultimate shooter who comes face to face with highly testing weather. As it is incredibly tough, you could even say it has been designed with rugged construction, this jacket is the one you’ll reach for every time when you need to head out in foul conditions. With a price point of £499.00 it isn’t going to be the jacket for everyone, but for those who have to go out on a truly awful day it will soon seem a great investment thanks to its exceeding features. 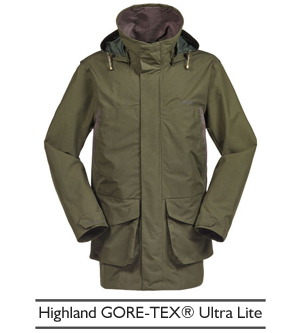 The Highland GORE-TEX® Lite is the second instalment from the Musto trilogy which has a more refined look and feel. Effectively replacing the Loddington Jacket in the Musto range and going head to head with the Ptarmigan range from Schoffel, this jacket has all the performance qualities that is needed on a wet and windy day. The GORE-TEX® Lite also offers its wearer a smarter overall appearance, making it an acceptable ensemble on a day’s driven game. 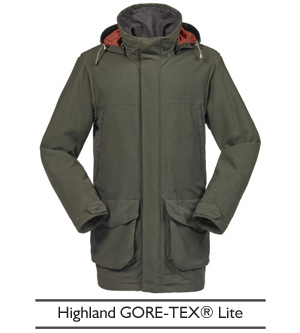 The third and final jacket is the Highland GORE-TEX® Ultra Lite, which is an extremely lightweight version of the original Highland. This jacket is perfect for those who don’t tend to feel the cold as much, and for those who like to shoot unaccompanied by the weight of a bulky jacket. The price point of £299.00 will make this a very attractive option. The bad news from Musto is that they have dropped the ever popular Keepers Jacket from the range. The longstanding Westmoor Jacket does however fill the void, and being lighter in weight is better suited to the mild winters of recent years. Moving on to Schoffel, who are also at the very top of the technical clothing spectrum. This year sees relatively little change in their jackets, which to an extent isn’t surprising. They’ve designed a jacket that fits so well and is constructed from such great materials, that they can only move forward when new fabric technologies allow. You can be sure that the brilliant Ptarmigan Range won’t be standing still for long. Watch this space, there’s bound to be more innovative designs soon enough. Sadly Barbour have reduced the size of their technical shooting jacket range considerably this year. 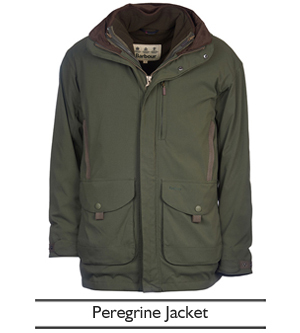 On a brighter note there is one fantastic looking addition, a new 3 in 1 jacket called the Peregrine. This particular jacket is packed with a huge number of practical features, and whats more it fits fantastically! Barbour have also kept in the Bransdale Jacket, which is one of the most versatile jackets on the market; smart, durable, medium weight, well cut, and suitable for almost any type of shooting. If you’re looking for a jacket that has a variety of different shooting characteristics for diverse days out in the field, then the Bransdale is a really good option. The stand-out shooting jacket from a mid-range price point of view is the Woodcock Jacket from Seeland. This is a crowded section of the market, with Deerhunter, Alan Paine, Laksen, and others trying to establish a stronger market share. Our experience suggests that Seeland offers a quality more akin to what you’d expect from a more premium brand, and as a result they seem to be establishing a strong reputation. Seeland have the luxury of being the sister brand of leading premium technical brand Harkila, which is most likely down to shared technical development. This also allows Seeland to create top quality products at the price they range from. There are a lot of quality Scandinavian brands trying to sell products into the UK market, however being designed for the Scandinavian market a lot of the products don’t quite suit the UK’s needs in terms of sporting jackets. 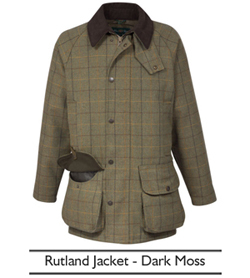 The Seeland Woodcock Jacket has the advantage of being designed specifically for game shooting in the UK, resulting in a jacket that is very much fit for purpose. The bad news from Barbour is that they have dropped the Sporting Feather Weight Jacket from the range; it was one of the best light weight jackets available. 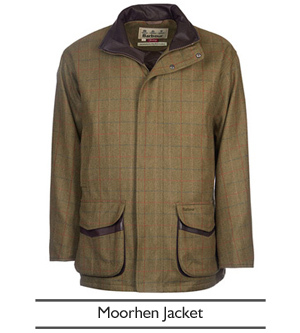 This now leaves the way clear for Musto’s Fenland Jacket to dominate this particular area within the shooting market. 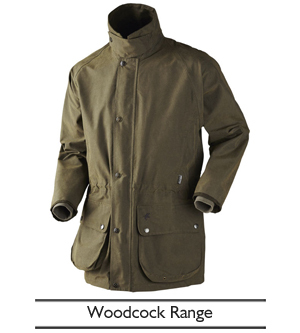 The Fenland comes in at just below £200, which is a highly reasonable price for such an advanced technical shooting coat. 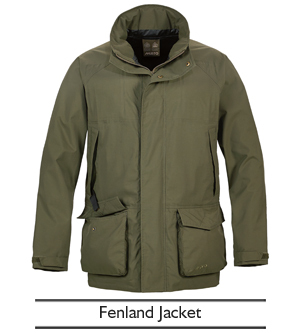 The Fenland weighs just 600g in total making it the very lightest of lightweights, yet it still looks like a full feature shooting jacket. 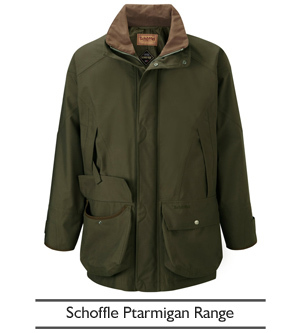 Schoffel’s Ketton Jacket is also a popular choice, but has not been specifically made for shooting. Schoffel’s Ptarmigan Ultralight Jacket is an exceptionally well-designed jacket, which is packed full of useful features. Looking specifically at the ladies market, Musto have produced what could be a winner. They’ve had the Ladies Whisper Jacket for many years, but at over £400 it is not in everyone’s price range, and for some it is also too heavy. 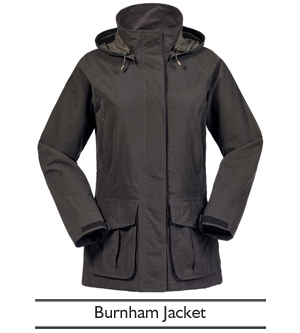 Introducing the new Burnham Jacket at just £229.00 (almost seems too cheap!). We strongly believe that it’s certainly well worth the price. The Schoffel Superlight Ghillie Jacket remains one of the most versatile all-round ladies coats on the market; it is packed with similar features to their leading Ptarmigan men’s range. We think that it’s such a shame that Le Chameau have temporarily withdrawn from the clothing sector, as their ladies jackets where full of practical shooting features and incorporated a much more stylish cut than many. However, they promise us they’ll be back with a great new range in a couple of years. If you have any questions regarding the shooting jackets mentioned above, then please contact us for further information. Alan Paine, barbour, Burnham, Cairngorm, Countryfile Live, Fenland, Ghillie, GORE-TEX, Harkila, Highland, Ketton, Moorhen, Musto, Peregrine, Ptarmigan, Rutland, Sch?ffel, Seeland, shooting, Shooting Jacket, The Game Fair, Tweed, Woodcock. Bookmark.